The bosal is made of 1/4" "pencil roll" braided rawhide. The nose of the bosal is 1/2" in diameter. A beautifully detailed harness leather hanger holds the bosal. 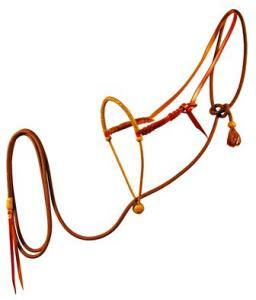 Braided rawhide knots hold the hanger in position on the bosal. The 12′ lead line, 3/8″ diameter, has rawhide braided knots at each end with an 8″ leather popper on the tie-up end. The lead is tied around the horse's neck and is caught at the poll by the leather hanger, holding it in position immediately behind the hanger. (If you tie a proper bowline knot, the rope will tighten upon itself rather that ever tightening on your horses neck.) The lead rope lays just behind the hanger around the horse's neck. The tie-up end is run down through the back of the bosal and is tied off on the saddle or may be tucked under the riders belt. You can google for tying directions for the knot or order Craig's DVD "What Knot To Do". This video ($24.95) includes 19 knots that are useful with/around horses, including the bowline.